Much has been written already about the world’s iconic military watches and their origins, with numerous articles on individual watches appearing over the years right here on Worn & Wound. In this series, we aim to do things a little differently by taking the reader on a world tour, stopping at a different country in each installment and discussing that particular nation’s military wristwatches, and for our first installment (released in two parts), we’re going to be covering the good ol’ U.S. of A.
America entered World War I in April of 1917, one year before the conflict ended, and it has been recorded that many doughboys arriving on the continent were in fact issued wristwatches. Though these watches were not given mil-spec markings like their counterparts issued to, say, the British Expeditionary Forces, certain models were produced specifically for military use and officially issued to U.S. soldiers. American watch manufacturing firms such as Waltham and Elgin produced watches for U.S. forces, and some were even given “ORD” (ordnance) markings upon being turned in for service after the war and later saw action during World War II. A War Department Technical Manual from 1942 even depicts these “trench watches” among its inventory. Image source: left – Elgin trench watch via LRF Antique Watches; right – Waltham ad via timepiece.blognook.com. The trench watch was essentially a transitional type of timepiece that saw soldiers trying to adapt the pocket watch for use on the wrist. At first, lugs were simply soldered on to an extant pocket watch and the timepiece was fitted with a leather strap. Eventually, however, recognizing the utility of a watch designed to be worn on the wrist to time artillery barrages, infantry charges, etc, the watchmaking community began designing and manufacturing them from scratch. Many issued trench watches featured a black enamel dial, radium-painted numbers and hands, a nickel or silver case, and an onion crown. 1934 saw the release of the A-7, a navigation watch meant for Army Air Corps pilots based on spec 27748. This timepiece was an oversized wristwatch adopted from a pocket watch movement and case and it was meant to be worn on the outside of a flight jacket. Delivered in both white dials (made by Gallet) and the more well-known black dials (Longines and Meylon), the A-7 featured a single-button chronograph with an onion crown and rotated dial, which allowed the pilot to read the watch without removing his hands from the cockpit controls and manipulate the crown and pusher without removing his gloves. 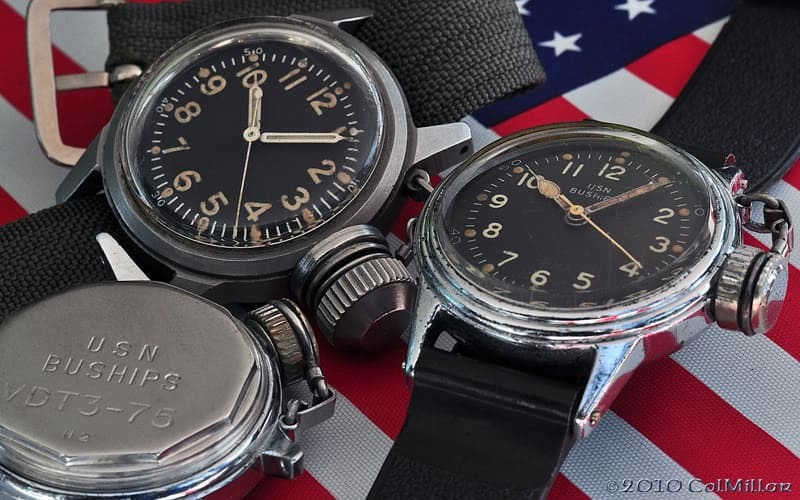 Information is more abundant regarding American military timepieces issued during World War II, when several distinct types of wristwatch appear, the most well-known of which is generally referred to as the A-11 (though this is actually the production standard, and not a model name). The U.S. Army required a watch that could stand up to the rigors of battle, and it developed the A-11 spec to be fulfilled by qualified American watchmakers. The standard called for a dustproof or waterproof casing; extreme temperature resistance; a high-quality, minimum 15-jewel hacking movement with a power reserve of 30-56 hours and a tolerance of +/- 30 seconds per day; and a black dial with white numerals and demarcations. Bulova A-11; image source: user StR via MWRforum. Another spec produced during World War II was the “Ordnance Department” watch (the Army Ordnance Department became the Ordnance Corps after 1950). These watches were intended for non-aviation personnel and were available in both black and white dials, almost exclusively with sub-seconds registers (with the exception of one variant). Manufacturers who produced these watches include Bulova, Hamilton, Elgin, and Waltham. Including both wristwatch and pocket watch variants, there were at least nine iterations of this spec, which were identified by a two or three letter code. A letter indicating the case manufacturer was stamped between the lugs of these watches. Of special note is a wristwatch produced by Hamilton and generally referred to as the “Canteen Watch,” or the “BuShips” watch. This timepiece featured the 987S movement, a sweep-second variant of the 987A (small-seconds) used in other Hamilton military watches, and was unique for its waterproof properties; the crown featured a captive, screw-on cover held in place with a small chain, and the crystal was soldered in place with lead solder to prevent water ingress into the watch. Hamilton and Elgin Canteen Divers; image source: user Nalu via Watchuseek. This early American military dive watch was issued to personnel from the Navy’s Bureau of Ships, which was responsible for designing and constructing ships, shipyards, and shore facilities, and for conducting salvage operations (among other duties); more specifically, the watches were given to members of the Naval Combat Demolition Units’ Underwater Demolition Teams (UDT), who cleared harbors of obstructions during the war. It is widely speculated that towards the end of World War II and afterward, many of the non-waterproof grade, chrome-plated watches were re-cased in stainless steel, parkerized cases and remarked as OF (the Ordnance Department/Corps designation for a 15- to 17-jewel wristwatch in a waterproof case). 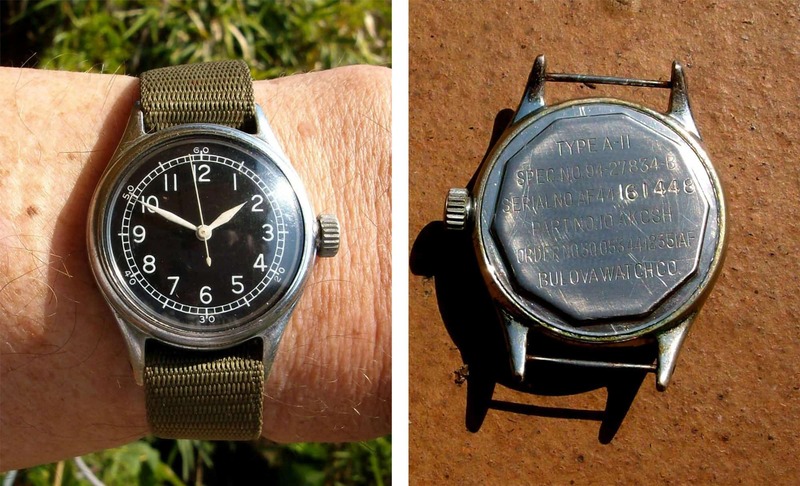 As many of these watches have also been re-cased more recently and often come up for sale as “frankenwatches,” it is becoming increasingly difficult to tell what work was done by the Ordnance Corps immediately following the war. As “ORD CORPS” is the post-1950 name of the Ordnance Department, any caseback marked as such post-dates WWII (though the movement inside may have been re-cased), and any case back marked “ORD DEPT” is likely WWII-era. Sometimes a case back is seen with the designation “1917-H”; these watches generally seem to be post-War issue, though occasionally a case back marked “ORD DEPT” is found with “1917” printed below the case manufacturer’s name, indicating that this may in fact be a case style/model number. In the early 1950s the MIL-W-6433 spec was released, and the A-17 was born. This watch, intended as a navigation timepiece for pilots, had been in development for some time as an upgraded version of the A-11, with radium added to the numerals, 5-minute indices, hour and minute hands, and the tip of the sweep seconds hand, and an auxiliary 13-24-hour track added to aid in reading military time. The back of the arrow-tipped seconds hand on these watches was generally “lollipop”-shaped. A short while later this spec was upgraded to MIL-W-4633A, and the A-17A was introduced. This watch, made by Waltham and Bulova, was very similar to the A-17, though it featured a parkerized case, hacking 15-jewel movement and slightly different handset than its predecessor. Bulova A-17A; image source: ambwatches.com. To further confuse things, there is another spec issued in the late 50s/early 60s that looks very similar to the aforementioned models but in fact differs from them in subtle ways. The MIL-W-3818 and later MIL-W-3818A specs call for a watch nearly identical to that of the MIL-W-4633/A spec, but as the original spec documents aren’t readily available, there is still some confusion as to exact issue dates, and whether the A-17A, a “navigation” watch, was in fact originally issued with a 15-jewel movement, or a higher-grade 17-jewel. Both the MIL-W-3818A and the MIL-W-6433A seem to use the same case and dial, but because of both the military’s tendency to re-case movements, and the modern tendency of assembling “frankenwatches,” it is difficult to say for certain, and the debate continues. Join us next time for Part 2, in which we discuss U.S.-issued military watches from the Vietnam War era through today.